This newly renovated cruise port is built to accommodate three ships and welcome thousands of travelers looking for a sunny, fun-filled day in the Caribbean. Come and enjoy the never-ending summer in Mahahual, the small fishermen-village where the port is located. With a non-beatable annual mean temperature of 80°F (27°C), everything about Costa Maya port is here to amaze you. Either if you are coming during summer or escaping from winter, Costa Maya will always welcome you with a nice weather, wonderful experiences and adrenaline-packed adventures. The fun is both inside and outside the port, so, book one of our Official tours and head to the beach to relax while sipping margaritas on a hammock. Go wild driving an ATV´s along the coastline or feel the mysticism of the Mayan Ruins in Chacchoben. Or stay in port enjoying refreshing drinks at any of our bars and tasting the ancient recipes coming to life in our restaurants. Seafood, street food, exotic dishes and fiesta are waiting for you to come and discover the real Mexico. Inside the port, you will find many free amenities, like a sparkling pool with activities for the entire family, complimentary beach chairs for you to soak in the sunrays, the most picturesque photo spots to brag about your visit to Costa Maya and the amazing shows and entertainment we have prepared for you. Besides the free amenities and a good chance for a shopping spree, our Interactive Experiences will delight your senses. Travel through time in a journey filled with Chocolate stories, have a zip of our worldwide ambassador, Tequila, while you learn about its production, feed exotic birds who come to greet you in Aviarius, or immerse in a holistic, relaxing experience with our Mayan Healing Rituals. 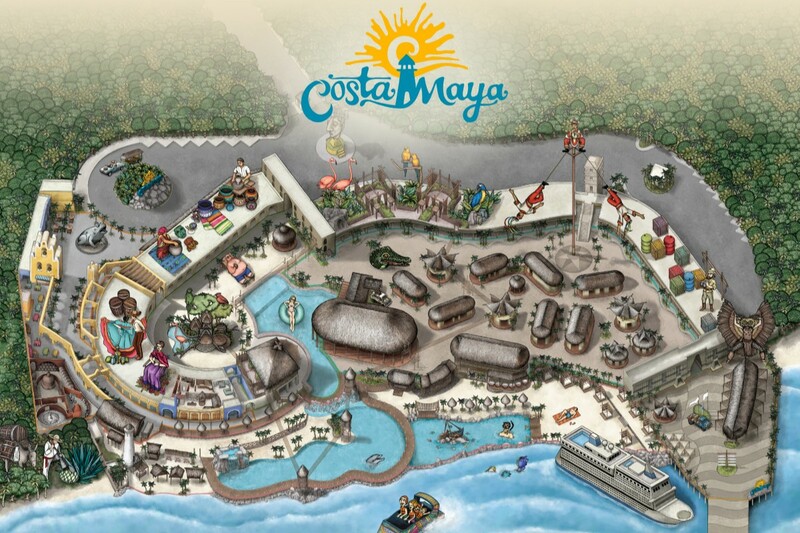 Now that you know everything about Costa Maya, come to enjoy the perks of living the Caribbean Life.